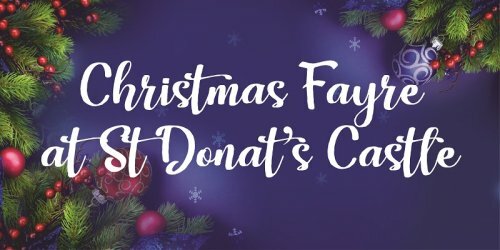 Join us at our annual Christmas fayre at St Donat’s Castle, UWC Atlantic College and browse a wonderful collection of over 50 food, drink and craft stalls to celebrate the festive season. This fayre offers a mix of traders from family friendly and charity stalls to luxury handmade crafts and gifts. Stalls include a variety of jewellery, wood, glass, ceramic and textiles as well as photography, paintings and festive decorations. Continue through to the food hall in the Tythe Barn to find stalls including bread, cake, fudge and chutney, before heading outdoors to the hot food traders serving up delicious foods for you to eat straight away. There will be various performances by students of UWC Atlantic College, mostly in the Glassroom café with views overlooking the sea, and not to forget, the chance to meet Santa is his very own grotto! There is something for everyone at this one-day event on Sunday 2nd December, 10.30am – 4.30pm. Entrance fee is £8 per car or £3 per person on foot or £6 per car and £2 per person on foot if booked before 19th November 2018.